Celebrate Madiba around KwaZulu-Natal (KZN) with these fun day activities. 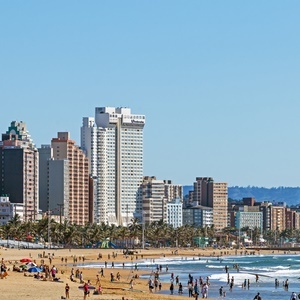 Whether you wish to keep it closer to Durban or are feeling like trekking out - there are attractions for whichever mood you're in. From the iconic spot where Madiba cast his vote for the 1994 elections to the site where he was captured and arrested 56 years ago. There is plenty of things to see around KZN to honour Tata Madiba's centenary. As part of the flurry of centenary celebrations taking place in honour of Tata Madiba, South African Tourism (SAT) launched a special mobile App called Madiba's Journey that can be downloaded on Android or Apple devices, encouraging all South Africans to experience Madiba’s legacy at 100 destinations across the country. The App was developed to help users locate and explore places that shaped Nelson Mandela’s journey and provides information on the Madiba attractions' operating hours, tours, ticket prices and contact information. Click here for more information. DID YOU KNOW The deeper meaning behind these Mandela monuments? If you find yourself seeking some Madiba vibes around Durban side, why not head just 30 minutes out of the city to Inanda for an informative heritage tour. The Inanda Heritage Tour takes you on a journey through the rich and packed history of KZN and offers you a range of sights to see. Explore settlements, churches and the iconic spot where Madiba cast his vote in 1994 on this trail! This settlement is where one of the major leaders of the twentieth century, Mahatma Gandhi, oiginally worked out his passive resistance against injustice. Inanda is also where John Dube - the first president of the ANC - was born and is the site where Mandela chose to cast his vote in SA's first democratic elections. The Ohlange Institute stands as a symbol of self-help and achievement. Founded by Dube, Ohlange was built from his dream to construct an institution similar to Washington's Tuskegee Institute in Alabama. Dube's goal was to enable the idea of training 'the head, the heart and the hand' in the service of God and one's fellow human beings. When Dube's dreams became actualised in 1901, Ohlange marked the first institute in Southern Africa that had been both African-founded and African-run. Next up... the Ohlanga Institute. Like Gandhi, John Dube dedicated his life to uplift his fellow Africans, through education, religion and hard work. As one of the founding member's of the ANC, Dube's school re-entered the books of history thanks to Nelson Mandela choosing to cast the first free and fair election vote in South Africa's history here. Situated about an hour's drive from Durban in KwaDukuza, Luthuli museum offers you insight into the life and struggles of a famous hero and iconic freedom-fighter that stood alongside Madiba, Albert Luthuli. The museum was Luthuli's former home, but now hosts a number of exhibitions - not just relating to Luthuli, but to other struggle heroes as well. You can be sure to weave through the past by learning about the various stories, writing and digital catalogues of Luthuli's work which sit within the museum walls. If you're feeling particularly adventurous and wish to make a day trip out of it - be sure to visit the Nelson Mandela Capture Site in Howick. The site sits about a 1.5 hour drive out of Durban, about a 25 minute drive out of Pietermaritzburg and around 5km out of Howick. The site holds a lofty amount of significance in SA history. As it name indicates, it is the exact site where Madiba was captured and arrested before his 27-year-long incarceration. On August 5, 1962, police had flagged down a car driven by Madiba in a chauffeur uniform on the R103 road near Howick - this was following a 16-month-long manhunt for Madiba who had been on the run and was at the time disguised as 'David Motsamayi'. In 2012, on the 50th anniversary of Madiba's capture, 50 steel rods of varying heights where wedged into the concrete ground. The rods collectively form a silhouette-type portrait of Madiba when viewed from a distance of about 35 metres in front of the sculpture. WHY NOT TAKE A Quick Guide to Madiba's long walk to freedom: A moment in Pretoria? However you decide to commemorate Madiba's centenary in KZN, we should always try to spread kindness and compassion to everyone around us even if we can't trek the journey to one of the listed sites, as that is just what Tata would do.